10 Sep 2009, 12:07 pm. Highpoint #40. 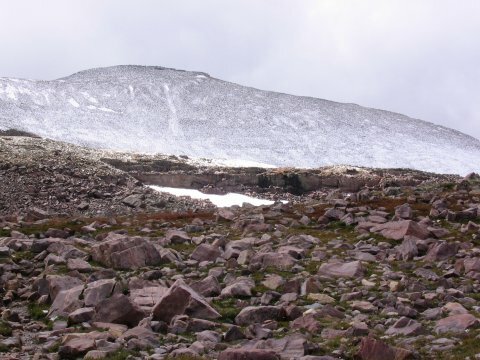 On 9 Sep 2009, I headed back to the High Uintas Wilderness to finally bag Kings Peak. 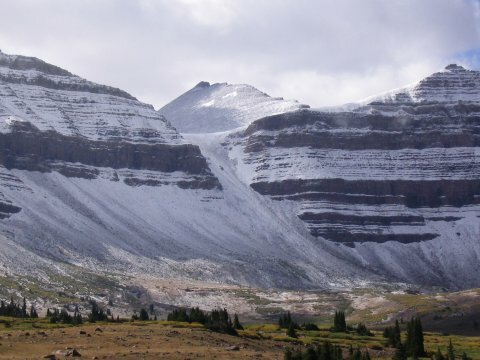 I had warmed up with some World Cup soccer action, a spectacular hike up Mount Timpanogos, and some other hikes in northern Utah. I started again from the Motel 6 in Rock Springs, WY, and got my rented car (which wasn't really supposed to be driven on the unpaved roads) to the trailhead about half past noon. Unlike my previous trip, there was no rain at all, and the trails were almost completely dry. The peaks were completely free of snow. It took a little under four hours to get to Dollar Lake, and I started setting up my tent right away. On my previous trip, I was setting up camp in a thunderstorm, and was not bothered at all by animals. This time, I was immediately assaulted by a completely brazen squirrel. As soon as I set my pack down, about ten feet from where I was putting up the tent, this rodent ran over and started chewing on my pack. It wasn't bothered in the least that I was standing right there. I tried hanging my food from a tree branch, but there weren't any within reach except very short ones, but at least this slowed the pest enough to give me a chance to finish setting up my tent. Then it was time to find a better solution! I had a little bit of utility cord, so I ran a line between two trees, and hung the food bag from that. Then I sat and watched the squirrel climb the trees, and jump down, trying to snag the bag as it fell. As a countermeasure, I raised the cross line as much as I could, and took out as much of the slack as I could in the draw string on the food bag. I had to climb up on a fallen tree to get up to where I was setting this all up, but finally I thought I had things set up so the squirrel couldn't get to the food. So I went on to the miscellaneous camp chores, followed by taking some photos of the peaks, and cooking a freeze-dried dinner. View about a half hour short of Dollar Lake. 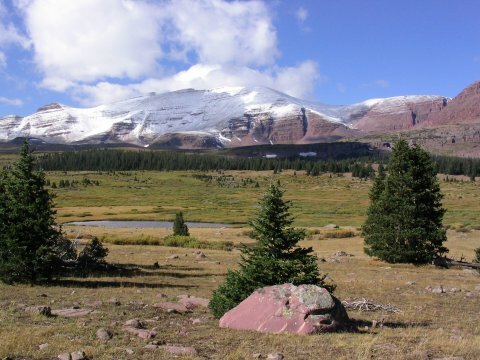 View of Kings Peak from near Dollar Lake. I got up at 6 am, and found my food bag was still unmolested. So I thought I had won! I loaded up, and by 6:45, I was on the trail towards Gunsight Pass. This time, I decided to try the high traverse along P-13103, instead of dropping down into Painter Basin. Without any snow cover, it was easy to find the 'use' trail to the right, just after crossing the pass. This unofficial trail climbed gently for a little bit, and then came to a steep section, with a little bit of scrambling, before coming onto flatter terrain at around 12200 ft. From here, the path, sort of marked by cairns (but without much if any visible trail), contoured around P-13103, over a mixture of tundra and talus. As I neared Anderson Pass, I veered left, with the aim of making sure I found whatever trail there was up the summit ridge of Kings. This was probably a mistake, as there wasn't much of a trail on the summit ridge anyways, and this path then went over lots of talus which was quite tedious. By the time I got to Anderson Pass, I was already sick of rock hopping, but I was nowhere near done! 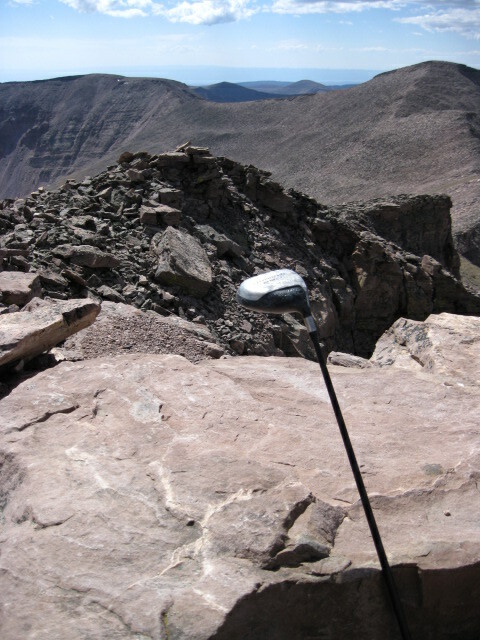 In hindsight, I probably should have stayed on more level, less rocky, terrain until I got to the pass. 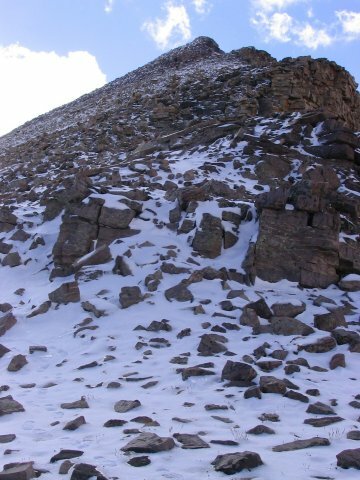 From Anderson Pass, a left turn led onto the bouldery ridge towards the summit of Kings Peak. I worked out some waypoints along this traverse, which are listed (along with a map) here. I didn't take this traverse on the way back, and some reports stated that it was difficult to find the correct place to descend the steep part just after Gunsight Pass. I stupidly did not record an explicit waypoint right after that section, but in hindsight, it was probably near N40 47.521 W110 21.634 at 12190 ft. 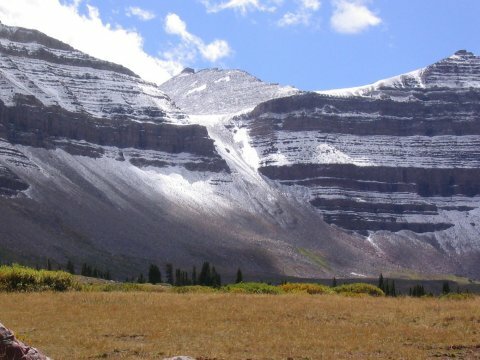 Looking up the summit ridge from Anderson Pass. Looking back at P-13103 and the traverse that bypassed Painter Basin. At about 10 am, I started up the ridge. There was not a cloud in the sky. At first, there was a little bit of a trail, and some cairns, but this petered out pretty quickly. The remainder of the ridge involved hopping over and around large boulders. As I started up the ridge, there were two people behind me, but they soon passed me, I was making pretty slow progress, as I am pretty sucky at boulder hopping, and I ended up sort of following their path. This took me somewhat to the left of the crest, which was probably a mistake, as the going was probably a little more awkward this way. I was getting pretty tired, so about 600 feet from the summit (and 150 feet below it), I stashed my pack. This gave me a bit of a second wind, and about 15 minutes later, just after passing the two other guys who had just started down, I turned right and climbed the last bit to reach the summit. Highpoint number 40! I was over the hill now! The view from the summit was spectacular. After spending some time to soak up the incredible view, it was time to make my way down. I retrieved my pack, and continued down the ridge. As I descended, I kept thinking that the terrain a little bit below and to the right looked easier, so I descended even farther away from the ridge, than I went on the way up. This was definitely a mistake, as some of these boulders were treacherously placed on the slope. At one point, one of the boulders I was crossing started to slowly slide down the slope, which really got my heart racing! I carefully veered left back towards the ridge, and soon after this, I reached the easier part at the start of the ridge (with the cairns and some trail), where I was basically out of danger. I had made really slow progress on the descent, returning to Anderson Pass at about 2:30, where I finished the last of the 3 liters of water that I had carried from camp. As I reached my campsite, I discovered that I had not won my battle with the squirrel after all. Apparently, in the morning as I was packing up, I didn't take out all the slack in the draw string on the food stuff sack, as I had carefully done the night before. So the bag was hanging about six inches lower than it should have been, which put it just in range of the (presumably) leaping squirrel. A bag of crackers had been pulled out, and my spice containers had been gnawed through, but what the rodent seemed to really be desperate for, was my bag of Dove chocolates. The only sign remaining of these was a few slivers of the foil wrapping. The biggest loss, however, was that the thief had tore a little hole into my dinner. It wasn't a big hole, the squirrel didn't seem much interested in my freeze-dried dinner (pretty smart really), but it was enough so I couldn't cook the food in the pouch as it required, so I had lost my dinner, and I had to make do with whatever snacks I had left. The next morning, I packed up, and made the straightforward hike back to the trailhead. After the hour or so drive on the unpaved roads, I returned to Mountain View and I-80, and headed back to Salt Lake City. After a stop at a car wash, to hide the evidence of my off-pavement driving, and a nights sleep at a motel, it was back to the airport, back to Austin, and back to work. For some reason, there was a driver on the summit. No golf balls though. 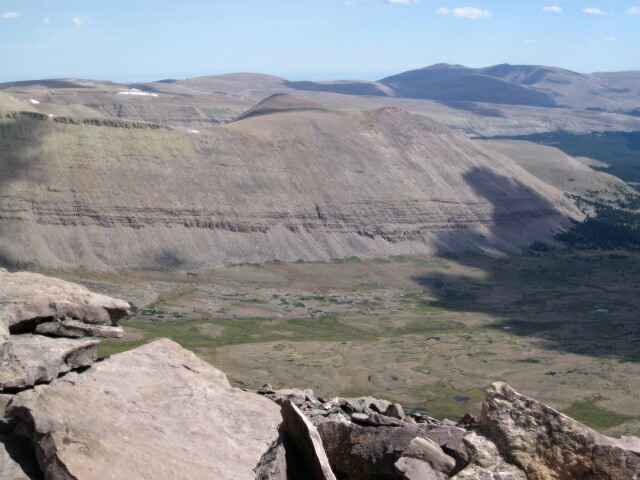 Painter Basin from the summit. 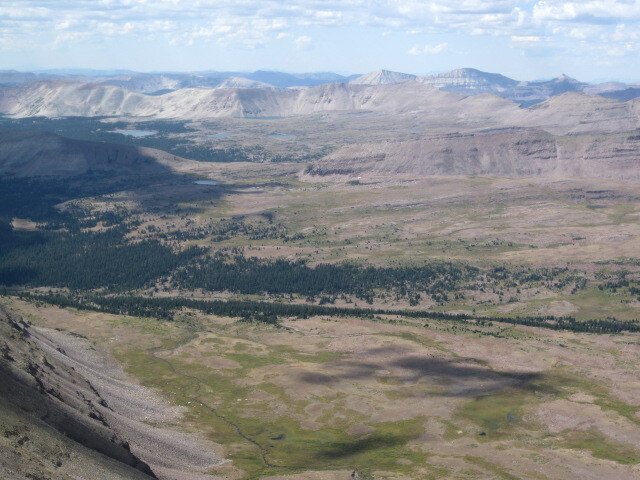 Looking back towards Dollar Lake and Henrys Fork Basin from the summit. Gilbert Peak, from the summit of Kings Peak. Gilbert Peak may seem higher in the photo, but at 13442 ft, it is actually 86 feet shorter than Kings. 9 Sep - I leave the Motel 6 in Rock Springs, WY, and head west on I-80 to Mountain View, WY, generally following the Winger directions. 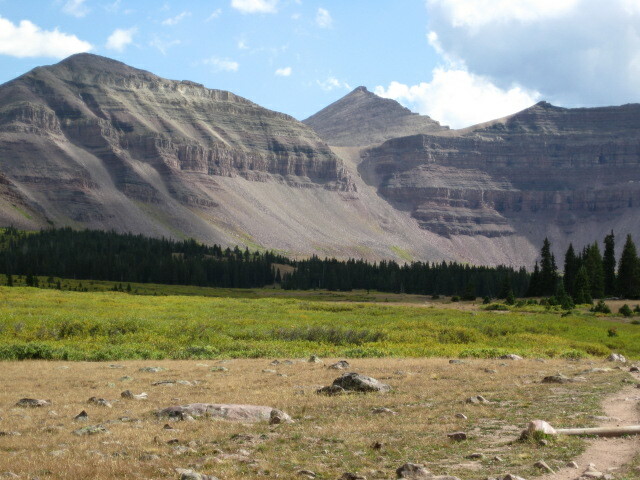 Past Mountain View, I turn onto the unpaved roads that lead to Henrys Fork Campground. The roads, although unpaved, are in very good condition, wide and with few ruts. The last leg, 3.5 miles along FR 077, is rougher but still no problem for my Honda Civic. 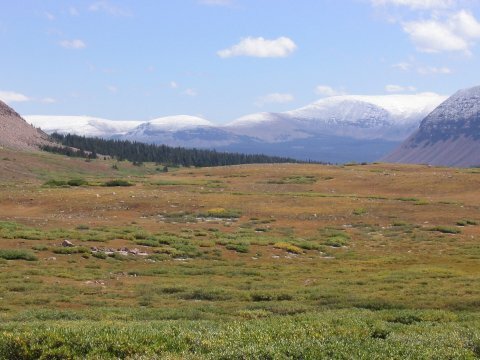 I sign the trail register, put on the backpack, and head south on FT 117 into the High Uintas Wilderness, towards Dollar Lake 7.5 miles away. The trail is very good at the beginning, as it gently ascends towards Dollar Lake. There is intermittent light drizzle early on, so I put on my rain jacket. After two and a half hours of hiking, I take a short break, and check my position with the GPS. I am making good time, I am close to the footbridge at the 5.5 mile mark. While I take my rest, several horses pass by. I chat with the riders, who say they are 'going over the top' and hope the weather, which looks poor ahead, holds. I am curious how it worked out for them, as the weather did not in fact cooperate. The horses move ahead, and I start up after them, soon coming to the bridge. After passing the bridge, the trail was less sheltered by trees and more in open meadows. Soon the weather starts to deteriorate... I start to get pelted by sleet, a little at first but soon a lot. Lightning flashes ahead. As I keep on towards the lake, the sleet turns into cold rain, which is worse. The terrain has a number of groups of trees, and I hope that the trail would head into one where I would have a little cover. No such luck, and as the downpour increases, I run off the trail for some trees. I add some layers against the cold, a fleece pullover, rain pants, and a balaclava, which was a little more armor against the sleet. After this, I hurry on towards Dollar Lake. The trail starts to be very muddy here, and as I jump across a mudpit, I see a lost boot, which had been swallowed by the mud. After all that, I have nothing left to do, but wait for the thunderstorms to stop. This doesn't happen until midnight, so I skip cooking a real dinner and settle for some bagels and a rice crispy treat instead. By this point, I still haven't seen either Dollar Lake or Kings Peak. 10 Sep - I am no mood to start early, with all my stuff wet and cold. The wind is nice and loud above the trees, which decreases my interest in putting on my cold, wet, wind/rain layer. I don't get out of the tent until 9 am, after the sun is out and the temperature has warmed up. I check my thermometer, it is up to 32 F by this point. I still have treat some water from the lake, which I haven't found yet. With all that, I don't hit the trail until around 10:30 am. As this late hour, I don't expect to get to the top early enough to be safe, but I don't want to sit around all day! I figure I'll hike towards the peak, to scout out the way, check out the views, and hope that excellent weather will give me a chance to make it. If not, I'll try again the next day. 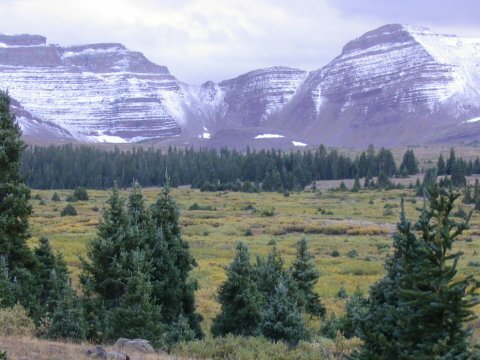 Very soon after starting on the trail, I leave the trees and have my first view of Kings Peak. 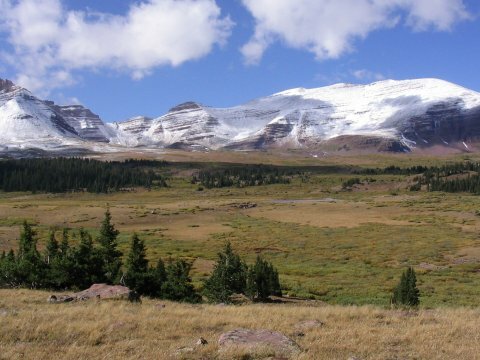 The trail continues south through open meadows towards Gunsight Pass, with views of the High Uintas ahead. The view is fantastic. 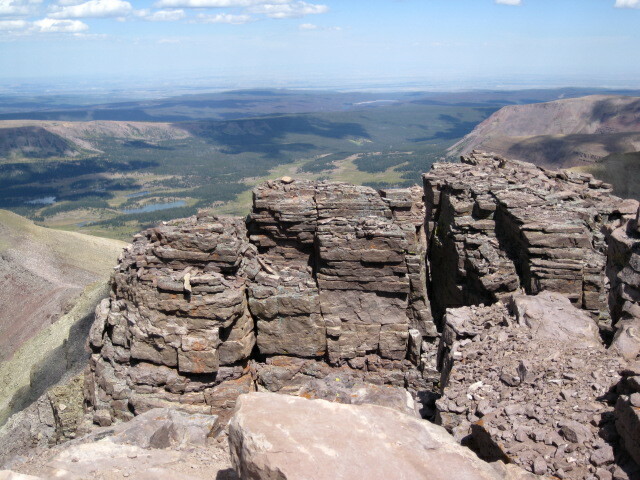 The red colored rock of the surrounding peaks, and the strata of the rock, remind me of the Maroon Bells near Aspen. With the blanket of fresh snow, the scene is very pretty. Kings Peak poking up behind Anderson Pass. 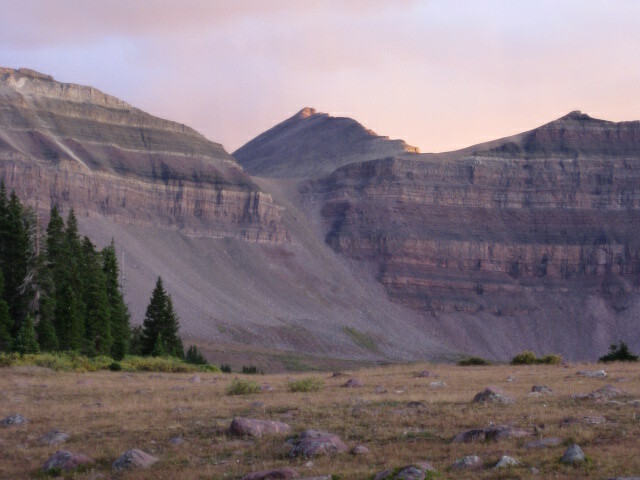 The High Uintas, with Kings Peak in the back. 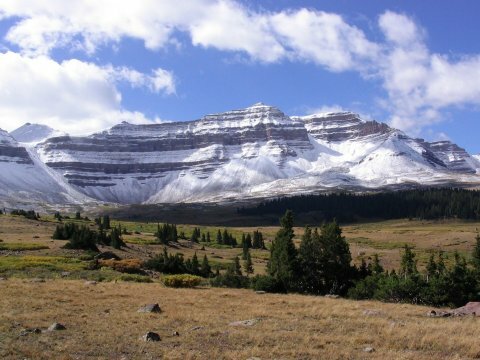 The summit to the left of Kings, Gilbert Peak, is a county highpoint. More views of the very pretty peaks. The trail continues south to Gunsight Pass, and after a couple of switchbacks it reaches the top of the pass. 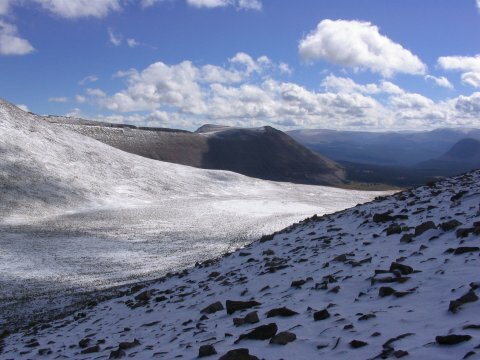 The pass is partially covered by snow. There is supposedly an informal 'use' trail near the top of the pass, but I do not find it. Instead, I stay on the official trail, which descends several hundred feet into Painter Basin. 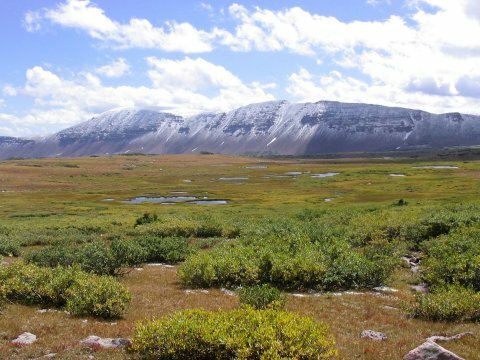 At 11500 ft, at an unmarked intersection, the main trail continued into Painter Basin, while a right turn leads along the side of the basin. I take the right turn, and follow the informal 'use' trail as it contours along the edge of Painter Basin, at around 11450 ft in elevation. The trail is mostly easy to follow, and is marked with cairns over some rocky sections. Soon, I pass two hikers who are concerned by the clouds building near Kings Peak. I share their concern, but I hope that the strong winds will blow the weather away. We all keep on, and at first, the weather did start to clear up. After about 2/3 of a mile, at 11440 ft, the trail comes to a rocky drainage, turns right, and follows the edge of the drainage uphill. The trail is somewhat harder to follow here, but the path is basically up, parallel to the gully. After a bit, the angle lessens, but the trail becomes even more indistinct. Continuing straight ahead, I rejoin the official trail at 11580 ft. This informal trail doesn't avoid much of the altitude loss down from Gunsight Pass into Painter Basin, but does cut significant distance off of the official trail. Exactly which trails I am on was a little confusing. There aren't many signs, and my path doesn't quite match where my maps say the trail is. I'm fairly sure I am on the 'official' trail except for the cutoff along Painter Basin. A map of my actual path, with GPS coordinates of the intersections, is here. I see some other 'use' trails as well. 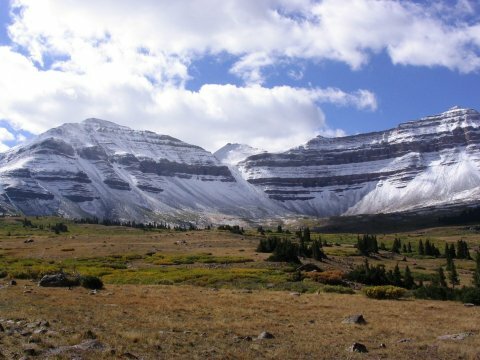 The trail now climbs to the west, towards Anderson Pass. By this time, more clouds have started to move in. The ground starts to be snow covered, getting thicker as the path continues uphill. When I reach 12080 ft, at 1:30 pm, the clouds were building substantially. At this late hour, it seems like time to turn back and return to my tent, and start preparing for a real attempt the next morning. 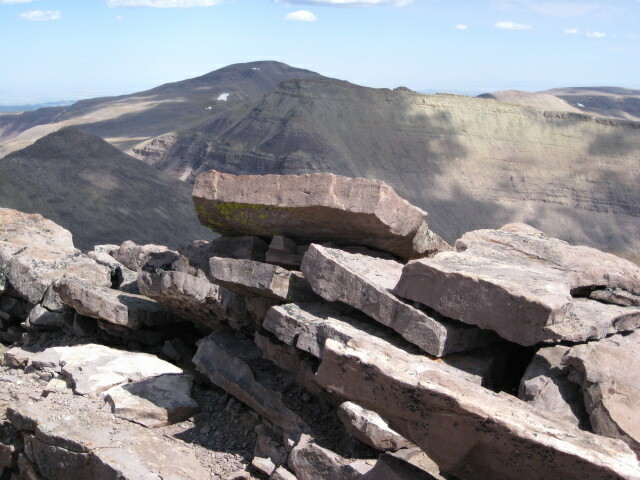 Looking west to the summit. Anderson Pass is off to the right. I head back the way I came, finally have a real (well, cooked) dinner, and enjoy the twilight colors on the peaks before going to sleep. View from near Dollar Lake in the early evening of 10 Sep.
11 Sep - I wake up at 6 am, a more reasonable time than the day before. When I start out, there is just enough light that I don't need my headlamp, so I can skip carrying that weight. The wind is even stronger than the day before, but still I make better time now that the trail is familiar. Some of the snow is gone, Gunsight Pass had cleared up a lot, but there is still lots of snow as I start to approach Anderson Pass. The trail gets hard to follow, and I wish I had brought gaiters as I plod through the snow. The snow gets deeper as I continue, and after dodging some snow covered streams, I lose the trail for a bit, and wander through the snow covered talus to Anderson Pass. 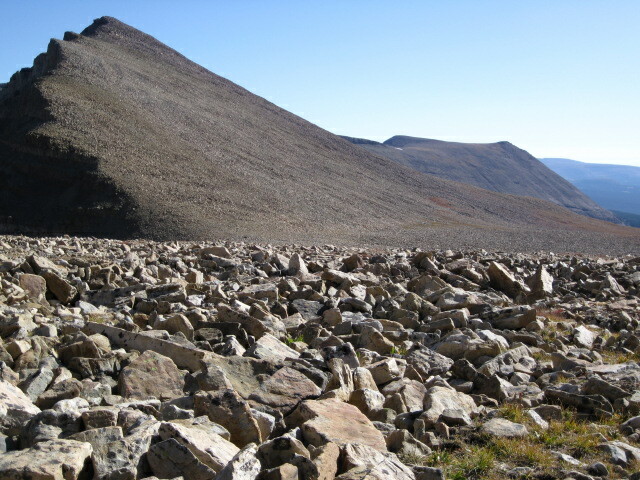 At the pass, the route turns left, gets steeper, and ascends a Class 2, rocky talus ridge to the summit. With all the snow on the rocks, I decide that this ridge is more slippery and treacherous than I care for. I don't have much experience in snow, so I am pretty wimpy, especially solo. I decline the challenge, and turn back. It is 10:24 am, as I check out the view from Anderson Pass, at 12740 ft, before starting back. 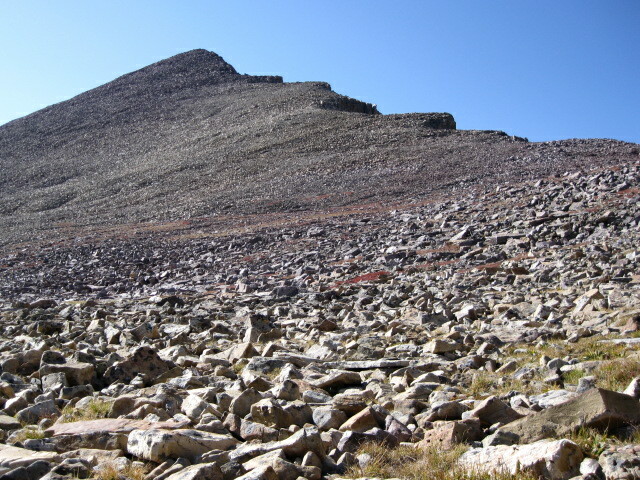 The final slope, from Anderson Pass to the summit. 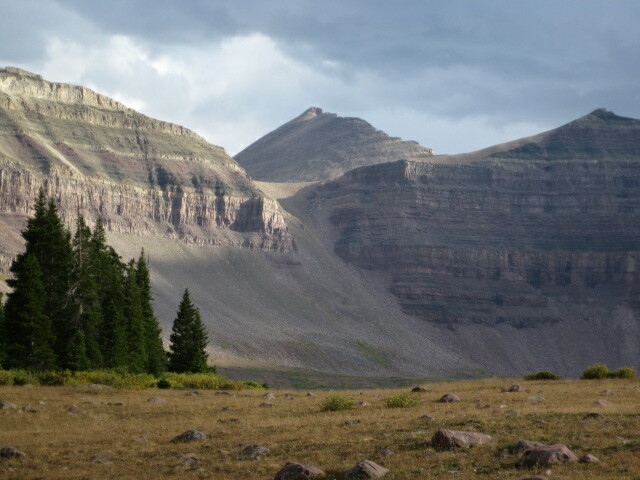 Looking back from Anderson Pass. Looking north over Anderson Pass, back towards camp. Kings Peak is to the left. To keep to my schedule, I need to pack out this same day, so I still have a lot of work left to do. I return to my campsite, back the way I came. I pass a few other hikers during the 5.5 or so miles back to camp. At least one of them made it to the top that day, and at least one other did not. Looking back on Kings Peak on the way home, on 11 Sep.
After a short rest, I take down the campsite, take two Advil and a big drink of water, put the heavy pack back on, and start back towards the trailhead. The only mileage information I have is that it is 2 miles to the footbridge. That takes me 50 minutes, so I figure 25 minutes per mile for the remaining 5.5 miles, and count down the time on the way back. Around 25 minutes early, I reach the trailhead, after hiking about 19 miles on the day. I still have time to drive out on the unpaved roads before dark, but at one point my progress is blocked. As I came up to a cattle guard, a cow lumbers out into the road, blocking my car. Is that what 'cattle guard' means? Eventually, the cow wanders off and I can continue. Once I reach I-80, I head west towards Salt Lake City, in preparation for the Texas vs. BYU soccer game. The state of Utah still had obstacles for me, however. Unknown to me, all the freeway exit numbers on I-15 had just been changed. I have directions to a motel south of Salt Lake, but I am looking for a specific exit number. These directions lead me nowhere. I am pretty tired by this point, but I have to keep on driving. I turn back north, and drive back towards Salt Lake. Eventually, I fiund a place, after about 40 miles of extra driving. Then, I learn how I have been tricked. Despite not standing on the summit, this hike was worth it for the views. I'll just have to go back!